Perched above the city, The Lothian Road Residence is a fantastic (not so) little pied-à-terre perfect for your next jaunt to Edinburgh. With three double bedrooms, stripped wooden floors, and views of Edinburgh Castle, this apartment is simply not to be missed. Taking prime position on the junction of Lothian Road and Bread Street, the light and airy lounge boasts urban views, perfect for people-watching in the cityscape below, or cast your eye right for your own private view of Edinburgh Castle. Stylishly furnished throughout, we invite you to rest your weary feet after a long day’s sightseeing or shopping. The large, flat screen TV and unlimited WiFi should keep you entertained until dinner, at which point why not take advantage of this fantastic location and explore some of the many restaurants and bars on Lothian Road below? If you’ve got the energy and enthusiasm, the fully fitted kitchen is perfectly equipped to help you rustle up your own culinary delights - perhaps using some delicious ingredients from the Castle Terrace Farmers’ Market, running just around the corner every Saturday. Three double bedrooms are decorated in minimalist design to help you switch off and dream the night away. A family bathroom with shower over bath, and separate WC complete this lovely home from home. In terms of location, this superb apartment could not do any better. Situated on Lothian Road, all of Edinburgh's main attractions are just a few minutes' walk away, including Edinburgh Castle, The Royal Mile, Grassmarket and The Old Town. The immediate area is filled with bars, restaurants, grocery stores and coffee shops, and Lothian Road is a main artery for buses running to all areas within the city. Haymarket and Waverley train stations are only 0.5 and 1 mile, respectively, and Edinburgh Airport is just 8 miles away. The nearest tram stop is on Shandwick Place, just a few minutes away at the end of Lothian Road. Exterior This apartment forms part of a traditional Edinburgh tenement. Accessibility statement This property is on the top floor without lift, and so not suited to those with mobility issues. Really easy to book and were quick to help with a few questions I had about payments. Awesome apartment in a great location. There are loads of restaurants, bars, supermarkets, Starbucks etc on Lothian Road itself, then you are also just on the corner of the Old Town and about ten minutes walk from the New Town. Everything was really clean and looked just like it does in the photos. Easy to arrange arrival and Calum was available when we had annoying questions! Beautiful little flat on the third floor of this historic building. There is a self service check in (with assistance!) and three double bedrooms. The flat is certainly worth the the three storey climb where it’s spatious, clean and ample room for six people. Whilst you may have to be efficient with the single bathroom the historic setting and views of Edinburgh life add to the charm. We enjoyed sitting on the wide windowsills and watching Edinburgh go by. The area around is full of interesting restaurants and theatre with a small corner shop on the ground floor. Great for a weekend away and would love to go back. It was so nice we almost didn’t want to explore the city. 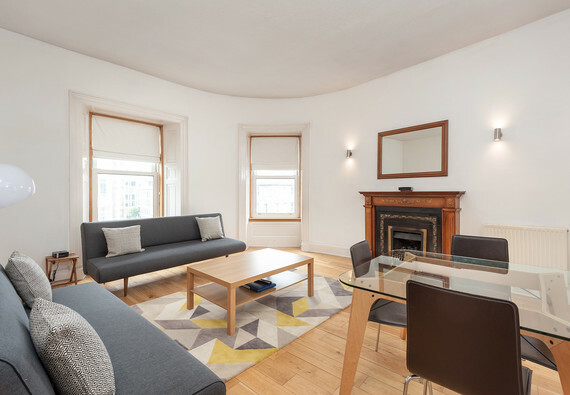 As mentioned in the purchase experience this is a beautiful flat right in the heart of Edinburgh. It was clean spacious and very stylish. We would certainly go back!